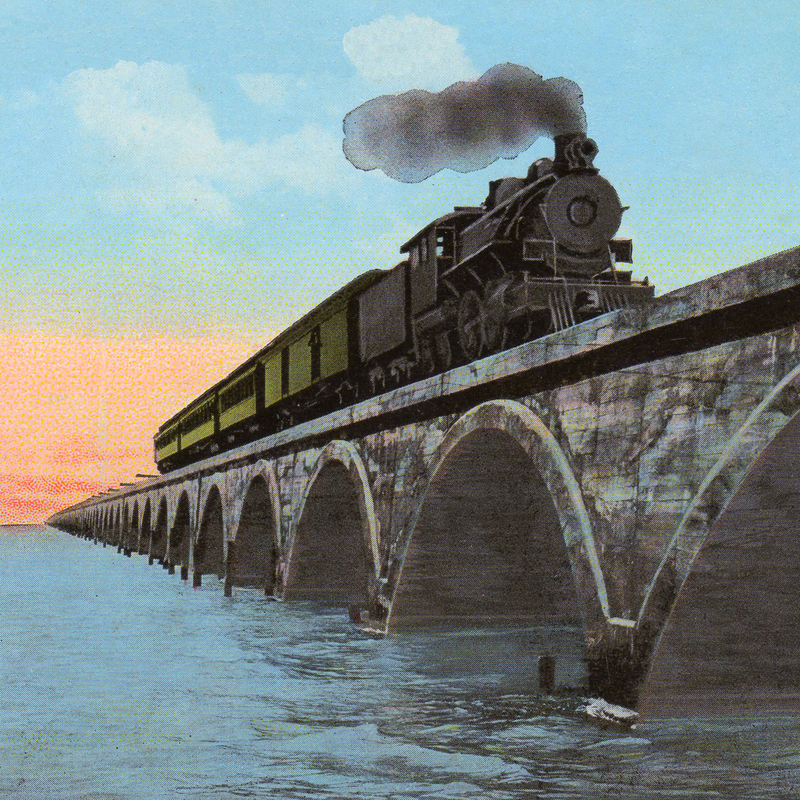 Take a journey on the Florida East Coast Railway’s Key West Extension – an overseas train they said couldn’t be done – with Key West Art & Historical Society’s exhibit Overseas to the Keys: Henry Flagler’s Overseas Railway. The newly-renovated permanent exhibit will debut with a special opening event Friday, May 26 from 6:00pm-7:30pm on the second floor of the Custom House Museum located at 281 Front Street. The exhibit celebrates an important part of Florida Keys history and the incredible engineering feat that joined mainland Florida to Key West. Key West Art & Historical Society’s original exhibition debuted in 2012 featuring several outstanding elements, including a railroad car that transports visitors back to the early 1900s when Key West first connected to mainland Florida, Flagler’s development of Florida’s east coast, and how his railway leapfrogged across the Florida Keys all the way to Key West. The car remains in the exhibit’s current interpretation, and new elements include an oversized map of the Florida Keys, home video shot from the railroad in the 1920s, and newly acquired objects and ephemera from The Society’s permanent collection. “By incorporating these elements, and some recent museum acquisitions, we hope to provide a more comprehensive experience for visitors. We want them to wholly appreciate the engineering feat involved in constructing the Overseas Railway,” says Society Curator Cori Converito, Ph.D. The oil tycoon visited Florida in 1878 to support his first wife’s ailing health, returning several times for its natural beauty, “but always found the journey and accommodation lacking,” says Convertito. “During his career at The Standard Oil Company, Henry M. Flagler never imagined he would be credited with the development of Florida’s entire east coast,” says Convertito. With these experiences driving him, Flagler embarked on a second career in his fifties as a hotel developer and railroad builder with the intention of bringing wealthy northerners to a region of the country he had grown to love. The shrewd businessman recognized that extending his Florida East Coast Railway to Key West’s deep-water port could result in immense financial gains from commercial maritime freight, and also understood that it would provide a direct connection to the mainland by something other than ships while bringing many pleasure-seekers to his resorts during the winter months. “If I don’t build it, nobody will,” he said. And build it, he did, proving naysayers wrong and spending over $50 million of his own money to complete his dream. While a portion of railroad tracks in the Florida Keys were wiped out by the most intense hurricane to ever strike the United States, thanks to Flagler’s solid engineering, several of the bridges were repurposed for the present-day Overseas Highway. The Society’s exhibit provides museum visitors the opportunity to take in this colossal achievement and pays homage to the man who made it happen. The exhibit and renovation has been generously supported by the William R. Kenan Jr. Charitable Trust, Thomas Kenan, the Monroe County Tourist Development Council, and Lamont Harris. In addition to Thomas S. Kenan being instrumental in the re-imagining of The Society’s exhibit on the Overseas Railway, the ties between Flagler and the Kenan family extend back to 1901 when William R. Kenan, Jr.’s sister, Mary Lily Kenan, became Henry Flagler’s third and final wife. Mr. Kenan served as Flagler’s consultant and became president and part owner of the Flagler System Companies upon the namesake’s death. The charitable trust was created upon Kenan’s passing, funded by the revenue from the very railway it now helps support in this exhibition. The Society welcomes members of the public to the exhibit opening from 6:00pm-7:30pm, with a suggested donation of $10 for non-members, and free VIP access and reception from 5:30pm-6:00pm for KWAHS members. For more information, call Cori Convertito, Ph.D. at 305.295.6616 x112 or visit kwahs.org. Your Museums. Your Community. It Takes an Island.